The Santa Rosa Junior College Board of Trustees approved a 230-unit student housing building and an incremental wage increase to get student-employee wages to $15 by July 2020, Tuesday afternoon in the Student Activities Center. The Cotati City Council directed its staff Tues., Feb. 26 to reach out to local businesses as part of a wider consideration to implement a new city wide minimum wage. Up to this point Cotati hasn’t had a localized minimum wage. They rely instead on the state one, which stands at $12 an hour for companies with more than 26 employees and $11 an hour for companies with fewer. The state minimum wage is set to rise by $1 every year until 2023 when it hits $15, but for some that may be too slow. A combination of high living expenses, low student-worker wages and a lack of financial aid threatens the academic future of many Santa Rosa Junior College students. 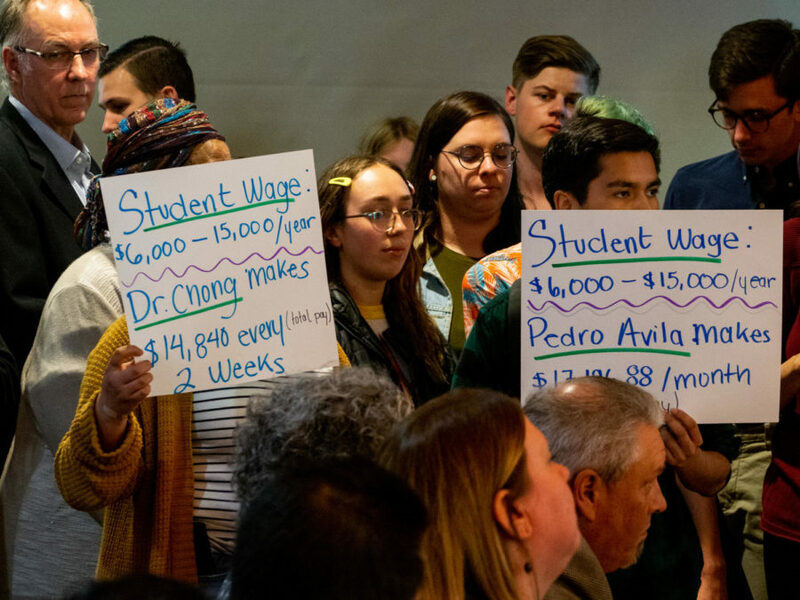 To improve their prospects, student-workers will again lobby college officials at Monday’s MEChA meeting for a $3 per hour raise. Nick and Ashley Harris have tried to establish rules about bringing their work at Petaluma Coee and Tea Company home, but sometimes it’s hard to avoid the spillover. That can be especially true when it’s a conversation about nances. The married couple has hopes of starting a family soon and purchasing a home in Petaluma, but scal discipline in Sonoma County doesn’t have the kind of returns that it used to. Get ready to punch the clock, local minimum wage earners – the City of Sonoma is thinking about giving you a raise. That’s where it stood at the close of the Feb. 4 meeting of the Sonoma City Council, when council members voted 5-0 to form a minimum-wage subcommittee to work with city sta to develop an ordinance that would raise the minimum wage in Sonoma to $15 an hour by 2020. The Sonoma Valley Unified School District announced Monday that it has reached a tentative agreement with the local school employee union to boost the pay for its lowest paid hourly wage employees, or “classified staff,” to $15 an hour – nearly three years ahead of the state-mandated minimum wage bump.